Readers, after a spell of ill health last week, I’m finally back at the laptop, editing pics and typing posts up. 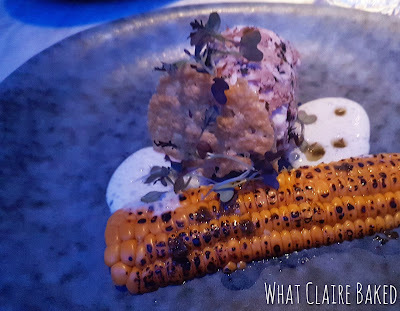 After our really lovely visit to Alston Bar & Beef the other week to try out the new pre-theatre menu, I was delighted to come back again to try out the new A La Carte menu. It was another Glasgow food blogger adventure we had... this time enjoying steak. Alston is fast becoming a Glasgow favourite of mine – from somewhere I didn’t know existed a few months back, to one of my steak hot spots in the city. As I mentioned previously, it’s hidden away UNDERNEATH Glasgow Central Station, but don’t be fooled into thinking this is a station food joint. 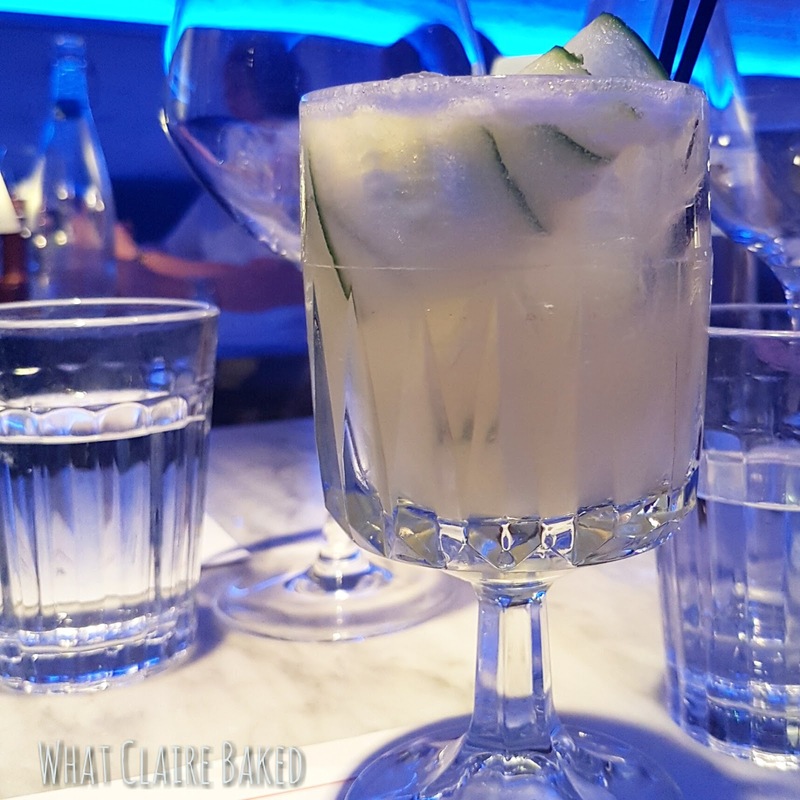 It’s a bar with great cocktails, fantastic gins and on top of that, it’s a restaurant with amazing steaks. There are veggie options on the menu, but I’d suggest this is more of a meat eaters paradise. The pre-theatre menu is incredibly well priced and as you’d expect, the al a carte menu is more expensive, but comes with greater choice and more indulgent starters and mains. There’s a an epic selection of steaks to please everyone at the table and we were blown away by some of the starter combinations. Note – the potion sizes are significant, so I didn’t get as far as sampling the dessert menu this time. I kicked off dinner with a gin cocktail – the cucumber cooler this time round, made with Hendricks and infused with cucumber. Mr WhatClaireDid went straight for a beer… for this man, it’s the classic combination. 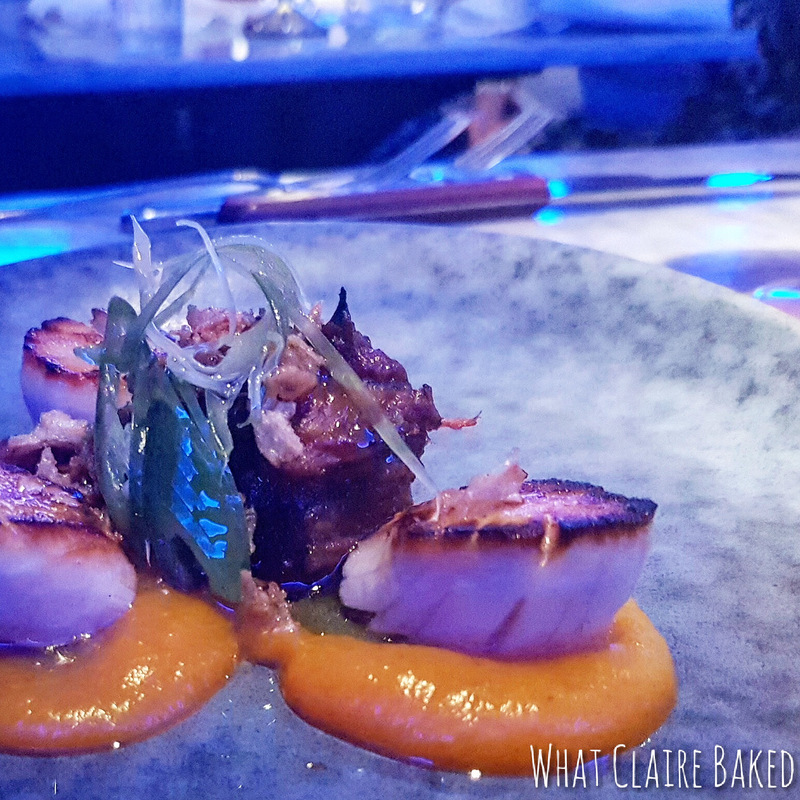 Mr WhatClaireBaked loves scallops –these were seared with burnt ends, served with butternut puree, crispy onions and a green chilli emulsion. Again, a beautifully presented dish, coming in at £12, but worth the money. Despite the huge choice of steaks available, we both settled for a 300g sirloin each. I had mine with plain butter, rather than garlic – it arrived softened nicely, to melt quickly on top of the steak. The butter portions are generous, so I’d advise a little at a time, rather than emptying the entire pot on the steak. 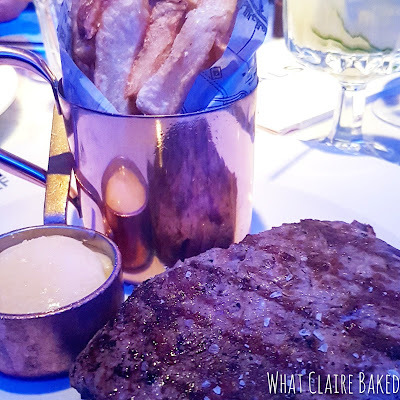 Not one to mess about with sides – it was skin on chips all the way – these arrived well seasoned, fairly chunky and guilty as it is it was… I may have dipped the odd or two in the butter. We went for a second side to share. I LOVE padron peppers when I go to Spain on holiday and it’s very rare to find them here… or when you do, they are always a bit bang average. Alston have these perfected. Blistered skins and served with smoked sea salt, they are great to pick at, during a main. Alston’s new a la carte menu is definitely worth making the trip out for… and if you do go…. Please don’t forget to have a steak. 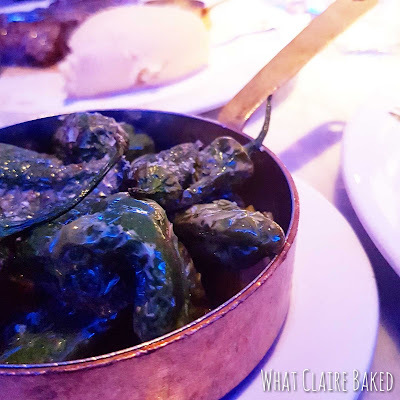 Oh and those padron peppers… I can’t rate them highly enough. To keep up to date with the latest news from Alston Bar & Beef, visit their Facebook, Twitter and Instagram pages. Disclaimer: I was invited along to Alston to sample the new a la carte menu. Any opinions expressed are my own.